House of books, originally uploaded by CláudiaM. I’m not entirely sure what kind of situation it is yet, but I know I have one. The problem is this: Whenever I leave the house, I come home with more books than I left with. I know what many of you are thinking; “I wish I had that problem!” No. No you don’t. You see, I leave the house every day. Its not even that I’m stuck with these books. About a third are library books, so they eventually go back… but thats hardly the point, now is it? My situation is this: I have no room. All bookshelves are at capacity, even beyond. The dreaded “To Read” Top shelf is layered. It started out neatly enough, arranged by size, brought forward to the edge of the shelf (as my dear Librarians taught me). Come May there were two or three paperbacks on top of the row. Now… we’re halfway through June. I have pushed back the first row and begun a second in front of it. I’m 10 books away from resorting to By any means necessary mode, (which is one step away from Crazy Cat Lady) and fitting them into drawers, crates, stacked on tables… Its reminiscent of Elinor Loredan in inkheart (excellent book-lovers book!). In any case, I’m curious as to how the book-house was managed, because it might be the solution to my problems. Oh! 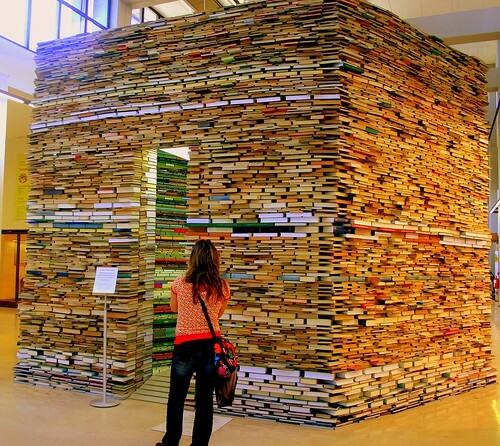 I know what you mean — perhaps the book house is the only way… By the way, you have made my heart happy. So glad you see you posting again, my dear friend! You have been missed. I love reading those children’s books too! I just got the complete works of Lewis Carroll, and I’m reading “Through the Looking Glass.” It’s fun. The book house might be it. And what a coincidence you wrote this on my b-day. I wish you luck with the books, because I am going to have that problem here pretty soon.